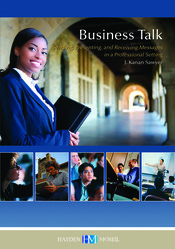 Business Talk was developed to refocus business communication course content on the art of message creation with an emphasis on verbal presentations. The text does give significant attention to communication in written forms (e.g., resumes, cover letters, online applications, outlines, visual aids) but with the primary focus on how talk moves through and impacts business contexts. Students learn skills to deliver presentations, engage in interpersonal meetings as well as send organizational, group, and interviewing messages in their choice of professional settings. The materials move from the basics of communication from audiences to receivers through listening to and researching messages, organizing presentation content, visually demonstrating arguments, communication in interviewing, and the ethics of communication in a business environment. The selection of chapters, content, and 100% of the examples come from current research in professional communication settings grounded in rhetorical traditions and theory.